Future Frogmen thanks Madeline, a Furman University student, for her contribution. Despite criticism from citizens, tourists, and environmentalists, the Bahamian government has given Disney Cruise Line the green light to begin development plans for a cruise port on the southern tip of the island of Eleuthera. The port will develop Lighthouse Beach, a 700-acre piece of land that holds cultural and ecological significance to the citizens of the island. Having an entire beach to yourself is hard to come by these days. It is not too often that you can swim in the ocean without the sight of a boat, or walk down the beach and not see a single house in the distance. At Lighthouse Beach, you are the only person for miles. What makes this place so special is that it is undeveloped – there is no parking lot, no sidewalk up to the beach, no restrooms, and only a poorly kept road that drops you off two miles from the beach. Lighthouse Beach is revered as Eleuthera’s best kept secret. This untouched land also allows for plant and animal species to flourish. Vegetation on the beach includes eight plant species unique to the Bahamas, and provides habitat to over 200 species of birds. Just off the beach, dozens of patch reefs thrive from little boat activity with various species of coral and fish. With the development of a cruise port, this biodiversity and untouched beauty of Lighthouse Beach would be lost. Dredging for the marina will destroy patch reefs and coral populations. Clearing on land for construction will lead to the removal of bird habitat. Runoff from construction could have unknown ramifications. Development will also impact local Bahamians and tourists. This area is used by locals for fishing and educational purposes, while tourists and Bahamians alike use the beach for swimming, hiking, and relaxation. Disney’s proposal shuts down public access to the beach and limits local influence and participation in the business model. 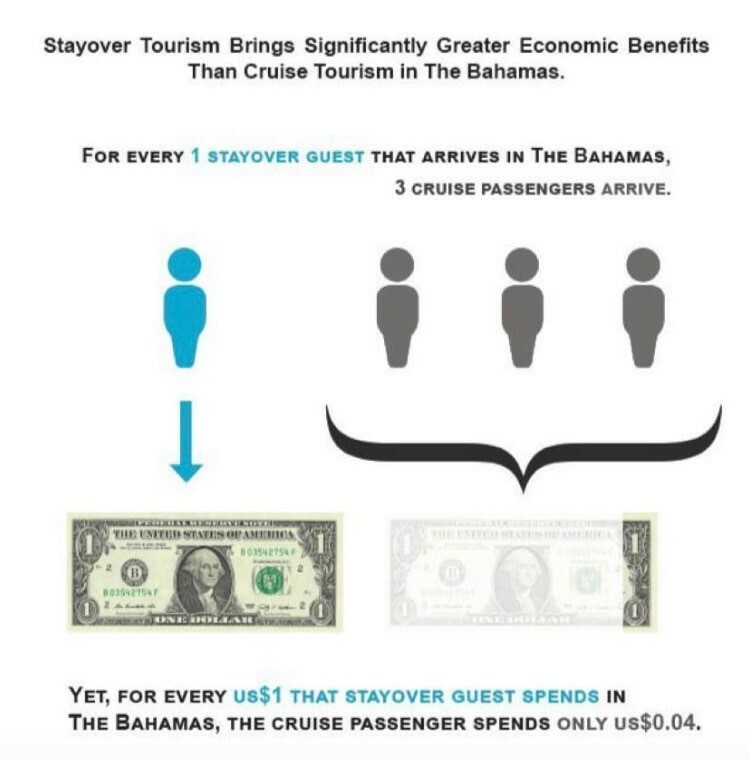 Tourist spending is also reduced by decreasing stayover tourism. This unsustainable development will have ecological and cultural consequences felt throughout Eleuthera and the Bahamas. Bahamian approval is tentative, and further research/planning will be taken into account before a final decision is made regarding development. There is still some hope that the southern tip of Eleuthera will be saved from urbanization—at least this time.